Promotional exams and assessments for this topic are the toughest detective, corporal, sergeant and lieutenant exams out there. 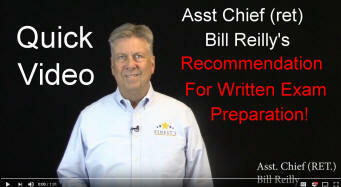 Here are the textbooks and exams you should use to prepare for your assignment or promotion to detective or investigator in a police or sheriff's department. Exams with over 500 questions, from over 100 great textbooks, are now available. What are the best textbooks to study TODAY for your future Criminal Investigation, Detective or Investigator exam? "I also spent 7 years as commander of my agency's CID - criminal investigation Division. And - yes - it is true that assignment as a detective, detective sergeant or detective lieutenant are the 3 best positions in law enforcement." The field of criminal investigation is such a technology-dependent and progress-intensive topic in law enforcement today that the body if knowledge is constantly changing, and the textbooks and the promotion exams and test questions from those textbooks MUST be constantly updated. Promotional Exams for Criminal Investigation and other police promotion textbooks can be taken by you to use as study material within the Advanced Police Promotional Testing Course at PoliceCareer.com. Then there is the immense VOLUME of information in criminal investigation, more than any other police promotion topic. These are HUGE textbooks, many of them over 600 pages. I often have to write over 400 questions just to touch on all the important concepts in the textbook. My BEST piece of advice on this page? If you believe you are taking a detective exam at any time in the future, you need to own and constantly read the material in the below four textbooks. The current edition of each of these four textbooks represent nearly a total body of professional knowledge on the topic of criminal investigation. Going back to the 1980's and 1990's there were just two or three comprehensive and widely respected textbooks in the area of law enforcement general criminal investigation. Truth is, they were such classics, they were seldom updated or revised. When the storm of DNA advancements and crime scene investigation technology hit (not to mention the CSI TV shows!) many of these classic textbooks could not be updated with new editions quick enough to keep up. Many new textbooks were written, diving deeply into the groundbreaking areas of DNA analysis, biometrics and all the technology advances. Criminal Investigation - the Art and the Science by Michael D. Lyman. This CI textbook is unique in that it explores the past experience of investigators as well as new and emerging techniques in forensic science. The author focuses on the steps and considerations involved in actual criminal investigations, and examines the many external variables than can influence an investigator’s success in the field. Visit us for the Criminal Investigation - the Art and the Science exam, test questions, study guide and flashcards. Criminal Investigation by Michael D. Lyman. An affordable, thought-provoking look at criminal investigations, focusing on core concepts. Lyman presents information that parallels the steps and considerations observed in an actual criminal investigation, blending scientific theories of crime detection with a practical approach to criminal investigation. Visit us for the Criminal Investigation exam, test questions, study guide and flashcards. Practiced worldwide, the Reid Technique® is the leading approach to interview and interrogation practices. Since 1962, hundreds of thousands of investigators have received training in the Reid Technique through Criminal Interrogation and Confessions. The updated, abridged version of this best-seller is now available in a new 2nd edition from the experts at John E. Reid and Associates, Inc. Criminal Interrogation and Confessions teaches readers how to identify and interpret verbal and nonverbal behaviors of both deceptive and truthful people, and how to move toward obtaining solid confessions from guilty persons. The Reid Technique is built around basic psychological principles and presents interrogation as an easily understood nine-step process. Separated into two parts, What You Need to Know About Interrogation and Employing the Reid Nine Steps of Interrogation, this book will help readers understand the effective and proper way that a suspect should be interrogated and the safeguards that should be in place to ensure the integrity of the confession. O'Hara's Fundamentals of Criminal Investigation has served as the 'Bible' of criminal investigation for many years. The author of this new edition has prepared this text for a new generation of criminal investigators in such a way that they will learn what is meant by a complete investigation and acquaint themselves with the proofs of the most important crimes. In addition, they will become familiar with the employment of technical methods and services that are available. The tools of the investigator are referred to as the three 'I's,' namely, 'Information,' 'Interrogation,' and 'Instrumentation.' In view of this factor, the technological advancements in forensic science, practices of criminalistics, computerization, electronic databases, and the Internet are presented, including the time honored methods of collecting information that are still effective and utilized. O'Hara's Fundamentals of Criminal Investigation 8E 2013 - exam, test questions, study guide and flashcards. Criminal Investigation - Basic Perspectives, by Lushbaugh and Weston. This book is very concise and well-organized, it presents the most recent investigative techniques and features real-life case studies to develop an investigator's ability to analyze, evaluate, and reason through a criminal investigation. Because of the author’s 50+ years of experience, this comprehensive textbook gives students a complete introduction to and understanding of the police investigative process. Visit us for the Criminal Investigation - Basic Perspectives exam, test questions, study guide and flashcards. Criminal Investigation - Swanson, Chamelin, Territo and Taylor - This is one of the most comprehensive textbooks in criminal investigation. It is a practical, step-by-step introduction to criminal investigation within a logical framework for understanding the investigative process. Covers videotaping of crime scenes, investigating street gangs, drug enforcement and dozens of other important, current topics. Does a very good job explaining the practical aspects of investigation in light of the difficult scientific concepts. Visit us for the Criminal Investigation - Swanson exam, test questions, study guide and flashcards. Criminal Investigation - Hess and Orthmann - this textbook has a practical, field-based approach to modern investigative principles and practices. It introduces the latest innovations in technology and science to give you a broad perspective of criminal investigations as it is practiced today. There is a lot of great detective exam subject matter in the coverage of DNA, terrorism, cybercrime, forensics, physical evidence, investigative photography and sketching, identity theft, white-collar crime, ethics, and many other current topics. Visit us for the Criminal Investigation - Hess exam, test questions, study guide and flashcards. Promotional Exams for all these textbooks can be taken by you to use as study material within the Advanced Police Promotional Testing Course at PoliceCareer.com. Having an in-depth knowledge of all these topics is crucial for a career in criminal investigations. Also, each of these topics will branch off into similar and related topics. Follow those branches! - You know about guns - how about ballistics? What type of light and/or substance should be used to detect invisible laundry marks? The interview style which is especially effective for obtaining information from victims and witnesses who have difficulty remembering an event is called the ____________ interview. Practical Homicide Investigation - some classic material and textbooks on the topic by Vernon J. Geberth. Very technical, but this site is a winner if you want to dive straight into the science of forensic investigations. For instance, when a dumb criminal takes a "selfie" do you know how to dig into the Exif metadata coding to locate the location where the picture was taken? I do. Sirchie has some of the best CI training in the law enforcement field. If you are new to forensic science or need a quick recap, this site has good overall material on every topic. What type or style of white collar crime has as a common method the act of "smurfing" ? Criminal Investigation Oral Board Question 1 - You need to STAND OUT- so Get Creative!